Nature decides when it’s time to harvest pistachios. In March the male trees start bearing the pollen which goes to the female trees through the air. 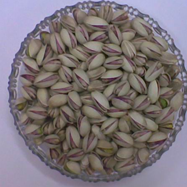 The pistachio trees blooms during April and the kernel develops during the month of July. Each season, the tree bears heavy clusters of fruits, which appear somewhat like that of a grape bunch. The enlarged nut pushes on the surrounding hard beige shell to cause a natural split, while the hull, which serves as a protective cover for the shell, usually remains intact. 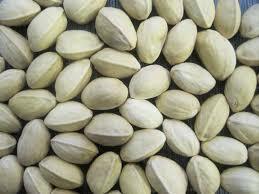 The shell of the pistachio is naturally a beige color and the inside kernels are naturally green color. Between the green seed and the beige shell, there is a naturally pink-red soft skin. 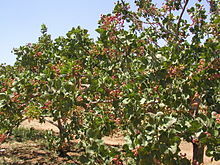 Due to our ideal weather conditions for the pistachios cultivation, the pistachios get ripe earlier than California and Iran. 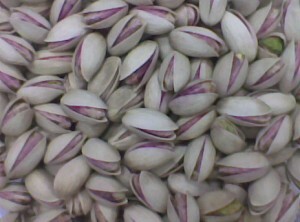 We harvest the pistachios from August to September when the fruit is mature and the shell has split. Our professional farmers use a long wooden sticks which are covered at the top with a rubber. We shake the branches of the pistachios trees with these sticks very carefully, because the branches of the pistachios trees are not so flexible and they can crack. Also the rubber protects the trees from being injured by the continuous shaking. Once harvested, the pistachio is immediately transported to plant for processing (hulling, drying and sorting).